Constructing buildings, roads and other infrastructure can have a substantial, temporary impact on local air quality. The most common impacts are increased particulate matter (PM) concentrations and dust soiling. Depending on the risk of dust effects occurring, monitoring may need to be carried out during both demolition and construction activities to ensure that the applied mitigation measures are effective in controlling dust emissions, and that there are no significant impacts on the surrounding environment. 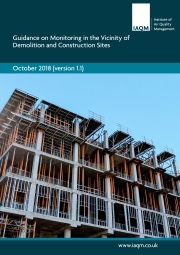 This document provides updated guidance on air quality monitoring in the vicinity of demolition and construction sites. It should be read and applied in conjunction with the Guidance on the Assessment of the Impacts of Construction on Air Quality and the Determination of their Significance that was published by the IAQM in January 2012, and with updated guidance on site evaluation guidelines and mitigation measures that is to be published by the GLA within a Supplementary Planning Guidance.